This 1974 production of Agatha Christie's 1934 classic directed by Sidney Lumet is a judicious mixture of mystery, murder and nostalgia. Which member of the all-star cast, onboard the luxurious train, perforated the no-good American tycoon with a dagger twelve times? Albert Finney as Hercule Poirot spreads unease among them with subdued wit and finesse. The city is Istanbul, the time is the 1930's and it seems everyone aboard the Orient Express has a motive, could it be the victim's butler (John Gielgud), the shy Swedish Missionary (Ingrid Bergman), the English Rose (Vanessa Redgrave), the Indian army Colonel (Sean Connery) or perhaps one of the other star studded cast including Michael York, Jaqueline Bisset, Lauren Bacall, and Anthony Perkins. 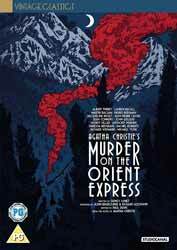 Murder on the Orient Express has an excellent plot. This is the first of several Christie adaptations and introduces Albert Finney as the internationally famous Belgian detective Hercule Poirot. This has to be one of the most successful screen adaptations of a Christie novel. Ingrid Bergman, although playing a dowdy Swedish Missionary, won an Oscar as Best Supporting Actress. In addition Murder on the Orient Express also received nominations for Best Actor (Albert Finney) Screenplay (Paul Dehn) Photography, Costume Design and was nominated for its excellent Music Score. Agatha Christie, was always reluctant to give her blessing to use the film rights to her books. She believed that the movie studios were all about money and not about delivering a product that stayed true to the source material. But she changed her mind when she discovered that Richard B Goodwin was the producer that wanted to adapt Murder on the Orient Express. Goodwin was responsible for breathing life into The Tales of Beatrix Potter (1971), a film that Christie loved. Albert Finney is almost unrecognisable in the role of Poirot. He was in his 20s at the time and had to be heavily made up in order to look convincing. Extras include Making of... (a collection of four featurettes that were recorded in 2004). These include All Aboard (13 min, 48 sec - look at getting the rights to the film and casting each character. Finney wasn't the first or even second choice to play Poirot, but Alec Guinness and then Paul Scofield were unavailable); The Ride (12 min, 05 sec - which looks at the filming of the passengers joining the train and its departing of the station. It also looks at how they took a little artistic licence with the look of the interiors of the carriages as well as the problems of shooting in such a confined space); The Passengers (9 min, 15 sec); and The End of the Line (13 min, 23 sec - which, amongst other things, looks at Sir Richard Rodney Bennett's music and in particular his waltz for the train, which enraged composer Bernard Herrmann when he heard it as he thought a waltz for the "train of death" was not appropriate). We also get a new interview with Producer Richard Goodwin (17 min, 30 sec - which pretty much repeats the stories from the Making of... features) and Stills Gallery: Behind the Scenes (1 min, 02 sec).